The Division of Diagnostic & Interventional Neuroradiology is comprised of 8 diagnostic faculty, 2 interventional faculty, and 5 fellows, specializing in brain, ear/nose/throat, and spine imaging. We have over 100 years of combined diagnostic and interventional imaging experience in our division. And unlike many other institutions, our radiologists work exclusively with the brain, ear/nose/throat, or spine—rendering a quality of care unmatched in the area. CT and MRI technology and advanced imaging techniques including perfusion imaging, spectroscopy, diffusion tensor imaging, and functional MR imaging. Imaging patients with headaches, seizures, and cerebrovascular conditions such as stroke, aneurysms, and carotid atherosclerotic disease. Imaging adult and pediatric patients with brain, head, and neck tumors, and patients who have suffered traumatic brain injury, or who are affected with neurodegenerative conditions. Performing vertebroplasty and kyphoplasty procedures of the spine. With 24/7 coverage, we offer minimally invasive techniques to treat patients, and follow up with their clinics as well as a multidisciplinary team of neurologists and neurological surgeons. We are proud to offer exceptional service to our patients and referring physicians. Our top priority is to ensure that each patient has a first-rate experience while in our care. 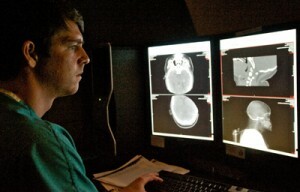 We are also committed to providing referring physicians with high-quality radiology reports in a timely manner, as well as immediate access to our radiologists to discuss results. For qualified physicians interested in advanced training, The Division of Diagnostic & Interventional Neuroradiology seeks candidates for several non-tenured clinical instructor positions. Candidates must have an MD or equivalent, and have successfully completed a diagnostic radiology residency at an ACGME accredited institution. The UVA NeuroImaging Lab is comprised of researchers dedicated to advancing scientific knowledge, education, and training in the field of CT and MRI technology and advanced imaging techniques such as perfusion imaging, spectroscopy, diffusion tensor imaging, and functional imaging. Note: Patients must have a referral from a doctor to make an appointment.